The 2019 Jeep Grand Cherokee comes in seven trim configurations; Laredo, Limited, Trailhawk, Overland, Summit, SRT, and Trackhawk. Each trim has its own set of equipment and features. Each trim is also available with rear-wheel or four-wheel drive, excluding the Trailhawk and SRT. Read about the differences between each trim level below! The first-trim level is the 2019 Jeep Grand Cherokee Laredo edition. The Laredo trim is fitted with technical features such as a 7-inch touchscreen monitor, Apple CarPlay, Android Auto, rear parking sensors, a six-speaker sound system, and keyless ignition and entry. Powering this base level model is a 3.6-liter V6 engine which is rated with a horsepower of 295 and 260 lbs.-ft. of torque, as well as an eight-speed automatic transmission. The second trim level for the 2019 Jeep Grand Cherokee is the Limited edition. This trim level builds off of the equipment seen in the Laredo trim while adding features like an auto-dimming rearview mirror, heated seats, remote start, and a power liftgate. The Limited trim level also gets upgraded leather upholstery and 18-inch wheels. The 2019 Jeep Grand Cherokee Trailhawk is well-known for its off-road capabilities. This year’s Trailhawk is equipped with a sport-tuned, adjustable air suspension system known as Quadra Lift and a four-wheel drive transmission. Additional equipment for the Trailhawk includes an adjustable torque management system, underbody skid plates, off-road tires, off-road dashboard controls, and hill descent/ascent control. 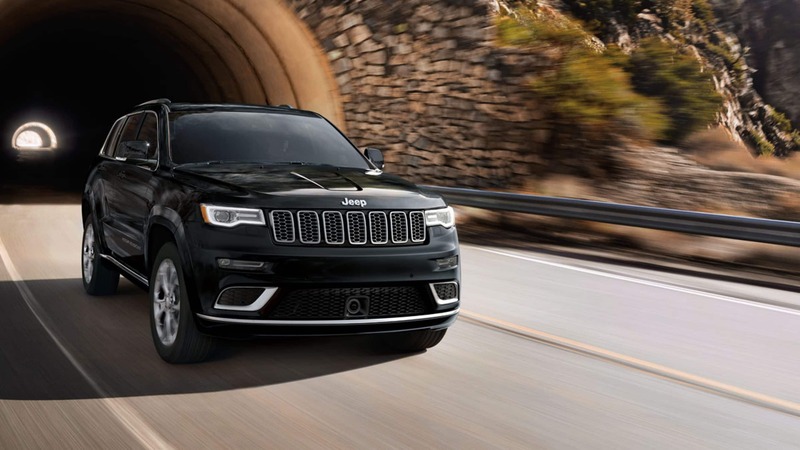 The 2019 Jeep Grand Cherokee Overland includes a select few of the Trailhawk’s off-road features, other than that it is equipped similarly to the Limited trim level. The 2019 Jeep Grand Cherokee Summit is equipped with larger 20-inch wheels, noise-reducing window glad, a self-parking system, and additional leather upholstery. This sleek trim level also features an upgraded 19-speaker Harman Kardon audio system. The next trim level is the sport-tuned 2019 Jeep Grand Cherokee SRT model. This trim level features equipment upgrades that turn the Grand Cherokee into a modern muscle car. Powering the SRT trim level is a 6.4-liter V8 engine which is rated with a horsepower of 475 and 470 lbs.-ft. of torque. Paired to this powerful engine is the eight-speed automatic all-wheel-drive transmission. Addition upgrades for the SRT trim level include a sport-tuned steering system, a sport body kit, 20-inch wheels, and performance tires. The top-tier trim level for the 2019 Jeep Grand Cherokee is the Trackhawk edition. The Trackhawk is fitted with most all of the upgraded equipment from the SRT trim level. The Trackhawk does have additional features such as Brembo brakes, 20-inch lightweight wheels, and an upgraded adaptive suspension system. Exclusive to the Trackhawk is a 6.2-liter V8 engine which is rated with a horsepower of 707 and 645 lbs.-ft. of torque, paired to the eight-speed all-wheel drive automatic transmission. Interested in the 2019 Jeep Grand Cherokee? Check out our listings here.